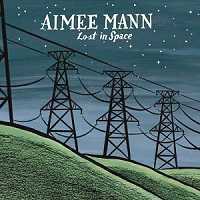 She wrote soundtrack songs for the film Magnolia (1999), and she has been favourably compared to Suzanne Vega, but Aimee Mann remains one of the best-kept secrets in pop/rock music today. Despite her penchant for bittersweet irony and melancholy, there's much about Ms Mann's work that is beguiling and fascinating. She's a melodic tunesmith of the first rank hidden within the US mainstream. The lyrics for Humpty Dumpty, a sharp lament for a shattered psyche and subsequent broken relationship, establishes the tenor of much that follows: "All the perfect drugs/ and superheroes/ wouldn't be enough/ ... /I'm pouring quicksand/ and sinking is all I had planned". The title track, Lost In Space, has a similarly haunted, introspective line bolstered by a lush guitar refrain that makes the low mood easily tolerable. This Is How It Goes has even clearer intent: these are songs about 'real' people living or surviving their real lives. So much pop rubbish aches for a perfect world of wonderful times and loving devotion. The fact is that a majority of us are troubled at one time or another (or most of the time), and it's so rare to find this sort of raw honesty in the commercial music scene that Mann's work delivers a well-meaning shock to the conscienceless system. Guys Like Me recognises the secret social treadmill we're all on, but the discovery causes merely a raised eyebrow, not a hysterical reaction. There's no full-tilt rock here, but jazzy compositions such as Pavlov's Bell, with its adroit sequences of guitar and keyboards, are often glorious. Real Bad News is particularly downbeat ("I got love and anger/ They come as a pair") but, once again, it's wholly contemplative rather than soul crushing. Obviously, wise Mann isn't a woman concerned with childish tantrums or recklessly destructive tendencies. Supported by a fulsome string section, Invisible Ink soars albeit briefly with the guarded urgency of its ageless yet impassioned message of ordinary human failure and everyday tragedy; the acceptance of limits. The overall effect of Mann's commendable restraint is quietly devastating. Who needs all that crying and wailing just to make a point, anyway? Today's The Day is more of the same, but with a slightly different tack, warning about the dangers of doing "what you do/ 'til it buries you". The gloominess seems to reach a thoughtful 'crescendo' with the final song, It's Not ("kiss me like a drug/ like a respirator/... /I believe it's you who could make it better/ Though it's not"). Almost summarising what's gone before it with the pristine quality of mature emotional enlightenment, this last track skilfully avoids the average grey murkiness of self-pity, bleeding heart temperaments, or witless misery. Lost In Space proves that intelligent, forthright, powerful music doesn't have to burst your eardrums or boggle your mind. There's a reassuringly sober, Zen-like essence to be found here. Go and find it, now.